148 out of the 178 metropolitan statistical areas (MSAs) measured — a total of 83 percent — experienced median home price growth year-over-year, down slightly from the 87 percent of markets that had increases in the first quarter. 25 MSAs had double-digit year-over-year median home price gains, a small decrease from the first quarter’s 28 metro areas. Until this quarter, the peak existing single-family home price was $229,400, recorded in Q2 of last year. However, Q2 2016 surpassed that number by 4.9 percent, registering a median single-family home price of $240,700. Mortgage applications increased 7.1 percent from one week earlier. The Refinance Index increased 10 percent week-over-week. The seasonally adjusted Purchase Index increased 3 percent week-over-week. Appraised values were an average of 1.69 percent less than what homeowners estimated in July. 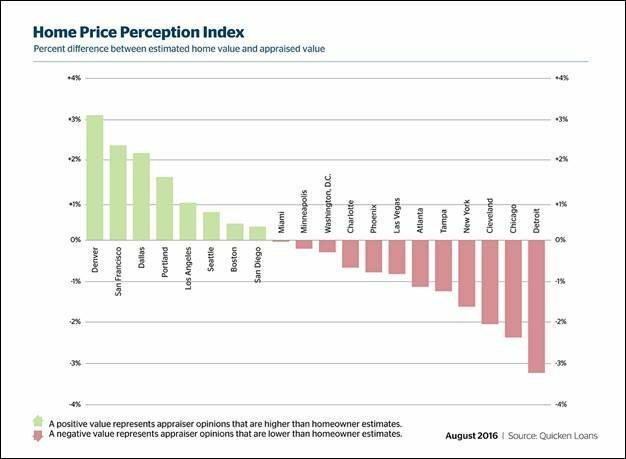 In June, appraiser opinions were 1.93 percent lower than homeowner expectations. Home values rose 1.43 percent from June to July and 6.24 percent from July 2015 to July 2016.